Hooked – Steven Sims Jr. Description: Dan Runte in the E3 Spark Plugs Bigfoot #18 won the King of the Beach title last week in his return to Virginia Beach, but the weekend ended on a sour note as he rolled the truck going over the bus stack Sunday afternoon. 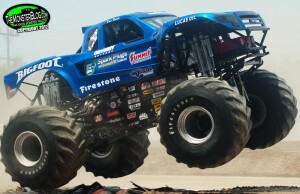 (Virginia Beach, Virginia – MTX Event Production PR) – BIGFOOT and Dan Runte returned to Virginia Beach 13 years after his appearance at the inaugural event in 2000 and narrowly claimed the King of the Beach title and the new George Carpenter Cup over hometown favorite Steve Sims in Stone Crusher. Runte appeared in all four final rounds of racing, winning 3 and giving up Sunday’s win to Doug Noelke in Tailgator. Those victories and solid performances in wheelies and freestyle throughout the weekend put him in a strong position to take the overall win. Sims, the Virginia Beach native and clear hometown hero, had been blasting the course all weekend and completely swept wheelies and freestyle competitions. 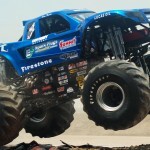 Three vicious freestyle runs took their toll on the Stone Crusher however and electrical problems caused him to miss the racing segment of Sunday’s show, virtually handing the win to Bigfoot. Young gun Jeremy Slifko and his Backdraft machine landed in 3rd overall with impressive freestyles each day. 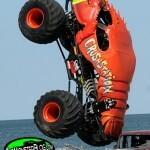 Dan Runte continues to have a great 2012 season, capturing the 2012 King of the Beach crown. 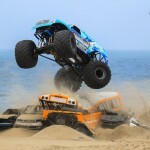 With all 4 performances at near capacity or sold out, fans also were treated to the debut of two brand new monster trucks. Maxie Broaddus of Tappahannock, VA showed off ‘Walking Tall’ on Friday night with an unscored freestyle exhibition. Steven Sims Jr. and the Monster Trucks Unlimited crew unveiled their brand new truck “Hooked” on Saturday afternoon with another unscored bonus freestyle. It competed on Saturday night and Sunday in place of Monster Magic who lost an engine due to a broken cam shaft. Scoring: 90pts available each performance (30/wheelies, 30/racing and 30/freestyle). 360 total possible. Description: Steve Sims had an incredible weekend at his hometown show in Virginia Beach, sweeping all the wheelies and all the freestyles. Seen here is one of his wheelie contest efforts where he takes Stone Crusher WAY past vertical! 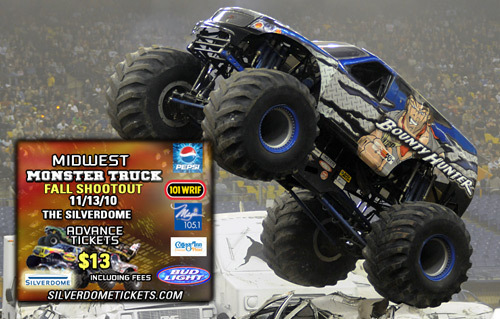 One week from now monster trucks will return to one of the most historically significant venues in the history of the sport as the Pontiac Silverdome hosts the 1st Annual Monster Truck Fall Shootout!! 11 trucks are scheduled to compete in racing and freestyle including Bounty Hunter, Raminator, Tail Gator, Virginia Giant, War Wagon, Big Dawg, Rammunition, Shell Camino, Bar’s Leaks Eliminator, Airborne Ranger and Rislone Defender. The return of the Silverdome has been one of the biggest and best stories of 2010 and TMB is excited to return for our 10th and final episode of TMB TV Season 3. We’ll cover all the action with three camera angles and two huge photo galleries. With tickets at only $13 at www.SilverdomeTickets.com, this event will surely be one of the best values of the year. As we countdown the days of this final week leading up to the big event, we’ll interview one of the big personalities and get their thoughts on the Monster Truck Fall Shootout. Check back every day for another quick Q&A with one of the event’s big stars! 11/07/10: Q&A w/Diehl Wilson | Countdown Status: 6 Days to Go! 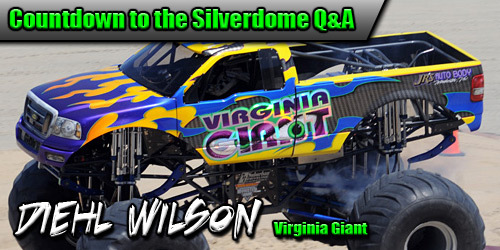 TMB: As we continue our Countdown to the Silverdome Q&A, its our great privilege to have the opportunity to speak with a true legend of monster trucks, Diehl Wilson with the Virginia Giant. Diehl, its great to talk with you and very exciting to see a driver with as much history in the sport and in this historic building invited to participate in the Monster Truck Fall Shootout. Let’s start by having you tell us about your history of competing at the Silverdome. 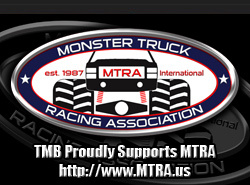 TMB: After first competing there over 30 years ago and still having one of the top pieces of equipment in the industry today, you’ve got to be excited about the opportunity to race there once again in 2010. Talk about your chances to take a big win Saturday night and tell us how much a win at the Silverdome at this point in your career would mean to you? DW: I’m really excited about running at the Silverdome again. Its a nice place, the crowds were always good, and there’s a lot of history there. The Silverdome was the first place I met Evel Knievel, that’s how long I’ve been going there! But I think we should run strong on Saturday, I think we’ve got a 50/50 shot at being able to get a win – racing more so than freestyle, probably. I’ve never really been a turning course guy so that will be the biggest challenge, but we’ll just have to step up and get after it. Freestyle to me – its not really luck I guess, but to win its always seemed like, things have to happen which you may not really plan but end up working out in your favor. It’s pretty important for us to run hard at this show, I’m getting a little closer to retirement so there’s not going to be as many chances to run at major events like this so we need to step up and do really well. TMB: Along those same lines, looking at the lineup of your competitors who would you say will be the drivers to beat in each competition? DW: The Hall Brothers will be the ones to beat in racing, they always run every round like its the last round and they will be very tough. But really, everyone will be tough and anyone could end up taking the win, there’s no slackers in this lineup. I think this show will be as good as any Feld show. TMB: Now over the last couple years of your career, you’ve mostly ran arena and fairgrounds style events. Your team has still performed at a high level, but how do you have to change your approach running a stadium course and when was the last time you had the chance to run one? DW: The last time ran a big stadium was probably 3-4 years ago when we went up to Montreal for an event. With racing, its the turning course thing and with freestyle you just have to tighten those belts down a little tighter. If you’re going to build a World Finals style course where you pretty much have to trash your truck to win, that’s not really my style but if its the average stadium setup then we should do very well. That’s the thing about this lineup, no one is going to go out there to trash their truck like at some shows so there’s going to be a good competition for the win. TMB: Diehl, we’d like to thank you for taking the time to talk with us about this weekend’s event, we’re really looking forward to talking to you on TMB TV and seeing the Virginia Giant running at the Silverdome. To wrap this up, tell us how you feel about the chance to run a show of this caliber to finish the season. DW: I guess it just means we have plenty of time to fix the stuff back up! We’ve already started getting ready for the new year, we blew a motor at an exhibition a while back so we’ve got a brand new motor in the truck and it’ll be good to get some time on that. The show will also tell us where we’re at with the truck and if everything goes well, we’ll just have a little bit more work to do to get ready for the winter season. The Monster Truck Fall Shootout is this Saturday, November 13th – 11 of the nation’s top trucks compete in racing and freestyle at the historic Pontiac Silverdome! 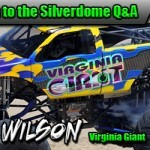 Advance tickets are only $13, all fees included at www.SilverdomeTickets.com – get yours now! The second episode in our four straight weeks of TMB TV is now online as we present our first ever Monsters on the Beach coverage!! 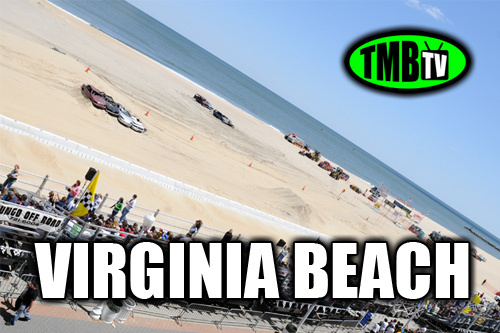 No doubt one of the most unique settings for monster truck racing in all the world, the action on beautiful Virginia Beach does not disappoint. Catch all the fun in the sand from 4 action-packed shows featuring big names like Stone Crusher, Gun Slinger, Crushstation and more battling it out in both side-by-side straight line drag racing and the fan favorite freestyle competition! Monsters on the Beach was one easily one of the most fun shows TMB has ever been part of! A huge thanks goes out to George Carpenter, Mike West, Beach Street USA, and all the teams for making this such a one of a kind experience. All the action is just a click away, we hope you enjoy and we’ll see you again next week for another all new episode of TMB TV.